Earlier this year Francois Levesque and Peter Seeberger laid out their plans for scaling up the production of the important anti-malarial drug artemisinin (DOI). Their vision: the industrial production from dihydroartemisinic acid in a single continuous flow reaction. This month in Science, science writer Kai Kupferschmidt is not so sure. Current artemisinin industrial production completely relies on extraction from the sweet wormwood plant. But help is on the way. Biotech company Amyris has trained special yeast cells to produce a precursor called artemisinic acid. 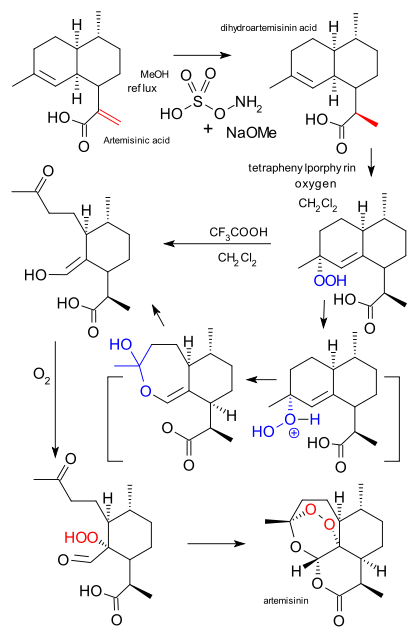 The dihydro acid can then be obtained from artemisinic acid via reduction with hydroxylamine-O-sulfonic acid / MeOH (diazene). In the Levesque/Seeberger procedure the next step to artemisinin is a photochemical reaction with singlet oxygen forming a hydroperoxide using teraphenylporphyrin as photosensitizer followed by an ene reaction. This step is then followed by a thermal Hock rearrangement initiated by trifluoroacetic acid. Another round of oxygen adds another hydroperoxide unit and another rearrangement forms artemisinin itself. This sequence takes place in a continuous flow reactor and in the photochemical step all the tubing is wrapped around the lamp for maximum exposure to light. So far so good but as Kupferschmidt found out, Amyris with backing from several charities and non-profits exclusively licensed the yeast cells to chemical company Sanofi. This company has decided the final chemical steps will take place via old-fashioned batch chemistry not flow chemistry. This is bad news for Seeberger but the man is not going to give up that easily. He is looking at two alternative ways to lay his hands on artemisinic acid: it is present in waste from sweet wormwood cultivation or better still, the plant can be engineered to produce it in larger quantities than artemisinin itself. Below: Seeberger with reactor in happier days (in German).